Studio Line: MGM - When East Meets West, the Champion remains standing. East meets West when Rocky takes on a vicious Soviet fighter who literally killed his last opponent! Rocky (Stallone) proudly holds the world heavyweight boxing championship, but a new challenger has stepped forward: Drago (Dolph Lundgren), a six-foot, four-inch 261-pound fighter who has the backing of the Soviet Union. This time, Rocky's training regimen takes him to icy Siberia, where he prepares for a globally-televised match in the heart of Moscow. But nothing can truly prepare him for what he's about to face - a powerfully charged fight to the finish in which he must defend not only himself, but also the honor of his country! DVD: Widescreen 1.85:1, standard 1.33:1; audio English Dolby Digital 5.1; subtitles English, French, Spanish; closed-captioned; double sided - single layered; 32 chapters; rated PG; 91 min. ; 9/30/97; discontinued - available on the boxed set only. Back when Rocky IV hit movie screens around Thanksgiving 1985, Sylvester Stallone was probably the most popular actor in the world. He’d provided a huge hit with Rambo: First Blood Part II earlier in the year and was flying high. The jingoistic attitude of that Vietnam-related movie jibed well with the mindlessly patriotic tone prevalent during the period, so the time was ripe for Stallone to exploit that attitude for all it was worth. As such, we finally get to watch Rocky (Sylvester Stallone) fight a white man. No, I’m not implying that the prior three Rocky movies took a racist approach to their lead’s foes; the state of affairs in boxing would have made it unrealistic for him to take on a white heavyweight champion, as black fighters have dominated the ranks for many years. Still, it was good to see the movie eliminate that black vs. white subtext, even though I don’t think any negative racial implications were present. Ironically, as Rocky IV wipes out any anti-black possibilities found in the older movies, it substitutes a much more negative attitude as the film totally buys into anti-Soviet hysteria. As the flick begins, we’re introduced to Ivan Drago (Dolph Lundgren), a Russian super-boxer who pops onto the American scene as a terrifying representative of his oppressive culture. Totally handled and manipulated by his chief, General Koloff (Michael Pataki), and his wife, Ludmilla (Brigitte Nielsen). Bored with retirement, former Rocky opponent - and ex-champ - Apollo Creed decides to stage an exhibition match with Drago to get himself back in front of the public eye and also make himself feel young again. However, things go tragically awry as Drago’s power is too much for old Apollo, and Creed goes down for the permanent camp. It’s bad enough that this robotic Russkie made the US look bad - now it’s become personal for Rocky! As such, he agrees to face probable death and take on Drago in an unsanctioned fight that occurs in the Kremlin Killer’s homeland on the pathetically-symbolic Christmas Day. Oy! To be blunt, Rocky IV is a very flawed movie. Actually, I hesitate to even refer to it as a movie; this is more like a 91-minute compilation of music videos. We’d get a few minutes of exposition and then bam! We’d move onto the next training montage accompanied by some crummy Eighties rock ditty. The flick never even remotely attempted to offer any form of character development, as it stayed with stereotypes and easy patterns. The Russians appeared least well-drawn of the bunch. Lundgren only says about seven words, and the other Soviets don’t get much better treatment. At least Lundgren proved to be a stunning presence in the role; he was quite intimidating and vicious as Drago, and his physical might made the part work better than it should have. In Rocky III, Stallone’s ego really got the best of him, as he made the title character little more than a buffed-up robot. That attitude negatively affected the whole film, as I think it’s the most soulless of the bunch. While Rocky isn’t any better drawn in RIV, at least Stallone seems willing to make him appear more warm and endearing. The Rocky seen in RIII bore absolutely no resemblance to the original character, while the man found in RIV occasionally betrayed some semblance of the old Stallion. It’s not much of a performance, but it represented a nice rebound from the prior flick. As the supporting characters continue to die off - Burgess Meredith’s Mickey got the axe in RIII and we lose Creed here - more and more of the burden falls upon Talia Shire’s Adrian and Burt Young’s Paulie. Unfortunately, the script does nothing to support them, so they turn into nothing more than simple caricatures. While she at least got to pop out a baby and fall into a coma during Rocky II, during the subsequent sequels Adrian is allowed to do virtually nothing other than support her husband. Paulie remains the film’s comic relief, though he shows none of the pathos found in the character during the first Rocky. That’s okay, since none of the crew display their old humanity. Both Paulie and Adrian now exist in the Rocky universe just because they’re supposed to be there; they have nothing to add other than face recognition. Surprisingly, one of the weakest aspects of RIV related to its climactic fight sequence. While this thing should have been a war, it flits by so effortlessly that it comes across as a light soiree. For all of its flaws, at least the ending fight in RIII was gritty and brutal, but RIV ends with a whimper. Note the elevation in Stallone’s ego represented by his post-bout make-up. Although it’s clear he took a much greater beating than in the first film, compare his bruised and battered raw meat face there with his modest damage here; it’s a telling indication of how unwilling the star was to portray himself in an unattractive manner. While it’s the thinnest of the series, I don’t think Rocky IV is the worst of the bunch; the extreme lack of heart evident in the third film really bothered me. RIV doesn’t manage much more warmth, but it doesn’t really try to do so, and perversely, that makes it more successful. It’s little more than a jingoistic, anti-Soviet screed that pummels us into submission with a slew of music video-style workout montages. The symbolism is ridiculously obvious - such as when one sequence alternates shots of Drago’s high-tech regimen with Rocky’s wood-chopping and snow-running - and the xenophobic attitude seems extreme even for that Cold War era. Nonetheless, Rocky IV was mindlessly enjoyable for what it was, and I didn’t mind the brief experience. 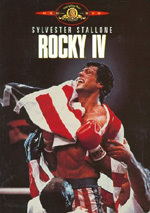 Rocky IV appears in both an aspect ratio of approximately 1.85:1 and in a fullscreen version on this double-sided, single-layered DVD; the widescreen image has not been enhanced for 16X9 televisions. Only the widescreen picture was reviewed for this article. While the picture was a step up from the prior three DVDs, it still had enough problems to only warrant a “B” rating. Unlike Rocky III, sharpness was not a concern during RIV. Throughout the movie, the image looked nicely crisp and detailed, with very little evidence of any softness. However, the lower resolution offered by the non-anamorphic transfer meant that I saw more jagged edges than were necessary, although they seemed less problematic than during Rocky II. One issue that occasionally affected sharpness related to the heavy usage of smoke effects during some scenes. Check out the scene in which Rocky brings Adrian the anniversary cake - it honestly looked as though the house was on fire! More smoke poured in during the Apollo/Drago press conference and throughout a few other sequences. I’ve seen smoke effects in many films, but I can’t recall one in which they were so overwhelming at times; it was an odd stylistic choice that occasionally made the movie look fuzzier than it should have. Print flaws were more subdued than during prior films, but they still caused some concerns. Light grit appeared at times, and I also saw examples of speckles and grit throughout the movie. These concerns were relatively minor, but they still added some distractions. Colors seemed good but unspectacular. The film offered some nice patriotic hues with frequent use of solid reds and blues, but these probably could have been a little more bright and bold. Nonetheless, they appeared clear and acceptably vivid. Black levels were similarly positive but not spectacular, though they also marked a step up from the prior films; dark tones seemed fairly deep and rich. Shadow detail usually came across as appropriately heavy and concise, but those oppressive smoke effects brought on some problems on a few occasions. Still, Rocky IV provided a generally positive picture that nudged against “B+” territory, but remained a high “B”. Also good but modestly flawed was the Dolby Digital 5.1 soundtrack of Rocky IV. After the extremely active soundfield heard during RIII, this more subdued mix seemed a bit surprising, but it still worked fine for the era. The track remained fairly heavily anchored to the forward channels, where I heard good usage of the spectrum. Audio appeared to be fairly well localized across the three speakers, and sounds blended together neatly. While not as aggressive as the mix for RIII, the soundfield presented enough ambient audio on the sides to make it fairly involving. Surround usage seemed limited to general crowd noise and musical reinforcement; the dizzying effects of the fights in RIII weren’t duplicated here. However, since the poor audio quality of the prior film also wasn’t copied during RIV, both soundtracks merited the same grade. The audio for RIV showed some flaws, but none of these were as severe as the concerns heard in RIII. Dialogue was a little flat but seemed fairly clear and natural, with no problems related to edginess or intelligibility. The cheesy synthesizer score provided some serious bass and was easily the best-replicated part of the mix; highs were clean enough - though the style of music didn’t lend itself to bright tones - and the low end seemed extremely deep and rich. Effects were a little more problematic, but I think most of those concerns came from poor foley work and weren’t related to replication issues. The various elements seemed thin but relatively clear for the most part, with one awfully annoying exception: the climactic fight scene. At that time, I found that crowd noises became moderately distorted and shrill, and some of the effects used in the ring were less than convincing. Especially annoying was the scratchy noise that tried to duplicate the sound of a boxer hitting the ropes; this element seemed very crackly and initially made me think there was a problem with the soundtrack as a whole. Keep an ear out for it; the noise appeared only in the left front speaker, and it’ll lead you to fear that one of your speakers is dying. Despite some weak links, as a whole the soundtrack of Rocky IV was fairly good, and it seemed satisfactory for its age. One audio-related defect continued to dog Rocky IV. The original DVD release of the movie failed to include subtitled translations of Russian dialogue, and the current disc continues to omit that information. Actually, it seems very likely that both DVDs are identical; MGM don’t appear to have done anything to alter the old release. As such, the subtitles remain missing in action. As do any kind of interesting extras, since the DVD fails to provide anything substantial. While the new release of Rocky added a slew of supplements, Rocky IV - and all of the other sequels - got the shaft. All we find on this disc is the film’s theatrical trailer. This seems especially chintzy since RIV originally came out on DVD in 1997, and that package at least included an eight-page booklet. No similar text comes with this new disc, as a leaflet with chapter listings replaces it. Cheap! Rocky IV is the least substantial of the five movies, but that doesn’t mean it’s the worst of the bunch. Although it was excessively thin and flashy, it provided some moments of general entertainment, and it didn’t do anything to actively bother me. That’s not much of a recommendation, but it’s about all I can muster. The DVD provided good but unspectacular picture and sound but it failed to include any substantial extras. Ultimately, Rocky IV is best left to the biggest fans of the series. Note: although this DVD of Rocky IV appears to duplicate the one originally released in 1997, that older disc no longer is in print. You may still be able to find it in stores, but MGM aren’t making it available to distributors. As such, it’s possible that you may not be able to find Rocky IV on DVD anywhere other than in the Rocky collection boxed set; that package includes all five films.